On the Google Earth’s photograph of Hamburg one may notice many points. After a number of close-ups they appear to be cylinders of industrial infrastructure, sets of silos, groups of volumes belonging to factories. 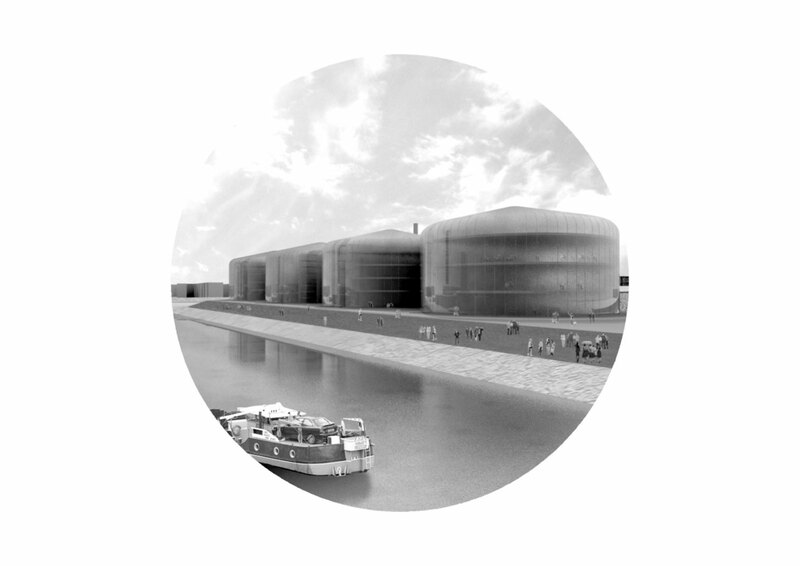 The cylinder – with its clean and unpretentious form – has dominated the silhouette of the western part of the Wilhelmsburg Island. It aspires to become a local architectural icon. Its abstract, loosely scattered constellations or compact, strict geometrical compositions articulate the space in a homogenous and interesting way that in any case does not remind a classic mass of inner-city urban block. The geometry of circle and its typology, reserved only for industrial machinery so far, becomes a starting point for a new structure, a reference for analysis and proposals of the spatial relationships within the entire island. Four independent sites, suggested in the competition as a study area, are arranged by means of four different urban codes. Their difference is two-faced: it relates to geometry of urban, always based on circles compositions and to various functions placed inside new volumes. The competition area, which has been raised 7 meters above the river’s water level and remained rectangular in shape, acts as a local forum to the four proposed cylindrical buildings. Inside the new silos there has been poured in a new content, a new mass, a new meaning. Ruled by a bar-code system, it delivers a functional and spatial differentiation.